February 16, 2011 - CHC Helicopter of Vancouver, British Columbia has announced a number of Executive management changes, including two appointments and two retirements. After 29 years with CHC Helicopter, Christine Baird, CHC's president of Global Operations, has announced her retirement from the organization. In 1997, when Baird became president of what was then Canadian Helicopters International, the company had annual revenues of $35 million. By the time Baird was finished leading the company through the mergers of Court, Lloyds, and Schreiner, Global Operations boasted revenues of $560 million annually. This amazing feat made Baird one of the most well known and respected leaders in the international helicopter industry. "Christine Baird has been a powerful visionary and leader who used her keen instinct to not just take over the world of helicopters but reshape it in her vision," said William J. Amelio, President and CEO, CHC Helicopter. " Although I have known her only a short time, integrity, charm, and a fierce tenacity are hallmarks of Christine's style. "Our recent win of Woodside is a testament to Christine's leadership. This is the biggest contract win in Australian history. After a legendary career with CHC Helicopter, I am grateful for the legacy of success Christine leaves behind. On behalf of the senior leadership team, her many friends and colleagues at CHC and elsewhere throughout the industry, I wish her all the best in her retirement." In other changes, Tilmann Gabriel will transition from his post as President of European Operations and take over leadership of CHC's Search and Rescue division. "Tilmann Gabriel has done an outstanding job with European Operations and his enthusiasm for growing the SAR segment of our business makes him the obvious candidate to assume responsibility for tackling the difficult task of growing this business," explained Mr. Amelio. In addition to Mr. Gabriel's transition, Scott Pinfield has been appointed interim leader of the new Flying Operations division. 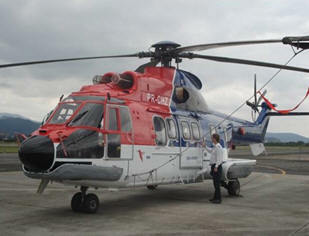 Mr. Pinfield has a sterling reputation with CHC Helicopter, having contributed to the European Operations team as Chief Operating Officer and latterly as Managing Director, European Operations. Mr. Pinfield will be responsible for integrating CHC's European Operations and Global Operations divisions into a single Flying Operations division. Benefits of this integration include the ability to deliver common standards on a global basis, an improved consistency of product, enhanced safety levels and increased levels of customer service. CHC also announced that Michael O'Neill will assume the position of Chief Legal Counsel, eventually replacing Martin Lockyer, who has announced his retirement from CHC. Mr. O'Neill joins CHC after serving as Senior Vice President and General Counsel for the Lenovo Group, where he was responsible for all legal affairs, contracts, government affairs, and security for the company. "I'd like to thank Martin for his dedication and passion for CHC and I am grateful that he has agreed to stay on to assist with Michael's transition into the role," said Mr. Amelio. During his tenure with CHC, Mr. Lockyer has been involved in every M&A transaction, refinancing and high profile operational issue CHC has completed. Examples include the acquisition of CHC by First Reserve in 2008, restructuring of CHC's Nigerian operations, recent successful bond offering, and providing legal oversight to the many commercial contracts to which CHC is a party. Last week CHC Helicopter expressed its disappointment at the government's decision to cancel the SAR-H program. CHC made it public that in November of last year CHC became aware that a small number of its employees acting without its knowledge or authorization of the company's senior management may have violated the company's standard of ethics during its participation in the competitive bid process. As soon as CHC became aware of the perceived irregularities it upheld those standards. It proactively and speedily approached the government to advise them of the circumstances without regard to the potential consequences of raising the matter. Since then CHC Helicopter and its partners in Soteria have co-operated fully with the government. CHC Helicopter is the world's largest helicopter services company, specializing in the transport of personnel to offshore oil platforms. The CHC Helicopter group of companies is also a world-leader in the provision of civilian Search-and-Rescue operations with major contracts in the UK, Ireland and Australia and a world leader in helicopter maintenance through its Delta, British Columbia-based division, Heli-One. ALPA, ?Swift FAA Reauthorization Critical To U.S. Airline Industry?